M-Audio unveiled the MicroTrack 24/96. 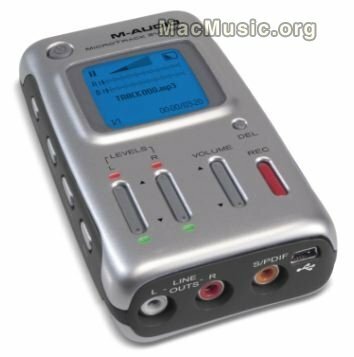 This very compact digital recorder works at 24-bit/96 KHz and records in Wav or mp3 files on CompactFlash cards or microdrives. The MicroTrack features a 1/4 jack input, a micro preamp (fantom powered), a jack output, digital in/out (S/PDIF), a RCA output and a headphones output. MicroTrack comes with Lithium ion battery. User can charge battery on a computer via USB port. MicroTrack will be available August '05 at 599 euros.